Ugh, I experienced an epiphany while perusing the Star Wars: The Old Republic update today — the X-70B Phantom is too good for the Imperial Agent. Is that a wet bar I see in the corner there? Hey, I may be a loyal subject of the Empire, but I’d french kiss a rancor before I let my hard-earned tax credits pay for some Imperial dolt to schmooze and booze his way across the galaxy. The lengthy Studio Insider entry that was released gives us a detailed look into the design process for the Agent starship, which should be of interest to the concept design/developer types. On a personal note, I have a lot of respect for artists who can render “techy” stuff. My own artistic strengths lie in living things like people or animals, so I absolutely admire those who can do things like ships, weapons and other machinery. I’m also once again amazed at how the creative process for something seemingly so minor can involve the efforts of a team the size of a small village. Really puts the costs and development time into perspective, in my opinion. Bioware made a good choice in featuring the Phantom’s design from the ground up, as I’ll grudgingly admit that ever since its details were released I’ve always thought it was the coolest ship — both in the looks and function department. It’s fascinating to see how the pieces come together — which concepts come into play at which stages and which influences make it through to the final product, from floor plans of the Ebon Hawk to ideas on what “a certain British spy” might drive. Now can I please have my Bounty Hunter update? Something tells me that the ship still won’t be as cool as the Phantom, but if it’ll have its own carbonite prisoner display room…okay, probably not, but a girl can dream. Also released today was January’s edition of Fan Friday which includes the usual fan creations, concept art, forum avatars and smilies — but also a special event announcement. 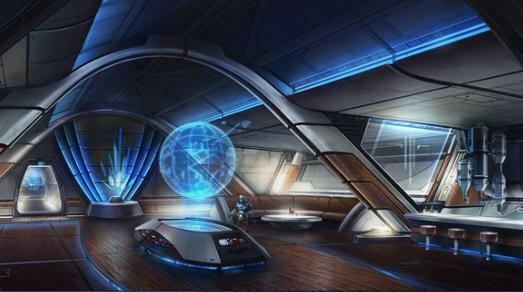 Not that we didn’t see this coming, but SWTOR will be present at PAX East later this year. I love it! I knew my first choice to roll an imperial agent was bang on. The concepts from start to finish were absolutely amazing. I had no idea how much thought went into designing one ship. LOL I said it before and I’ll say it again, the IA ship makes the other ones look like junk buckets, though something tells me that for the smuggler’s ship (which was what the Ebon Hawk was too) that was the main idea 😛 The agent knows how to live the life! something inside me says a secret agent should be a lot more subtle. they should be incognito and fit in. not drive around in expensive ships that will draw the eye, but i suppose if they’re basing this on james bond they don’t have much choice. The Rule of Cool, man. To be fair, the Troopers in the Hope trailer never should’ve given up the high ground, either. But jumping down into the pit of Hell with guns blazing is just much cooler, and so it is acceptable. Same with the ship. Before this update came out, I was convinced the Imperial Agent had the best ship in the game; after this update came out, I was convinced the Imperial Agent had the best ship in the game. The moral of the story is, the Imperial Agent has the best ship in the game. The end. Though I have found something about all the ships to like (the military look of the Trooper ship, the darker, sinister vibe of the Millenium Tie Fi–I mean, the Sith ship), they don’t compare with the IA ship. The Imperial Agent ship is just a space yacht. They used that same description in the developer description for the ship, and it is very appropriate. If my main was going to be an IA, I would probably be doing backflips knowing I get to cruise around in something so shiny and awesome. That said, I am still looking forward to rolling around in my Sith Fury ship. Aside from the ship description, I enjoyed some of the other tidbits from the update. Overall, I enjoy this new format they have for releasing a Fan Friday (adding some developer stuff on top of it). It just makes me think back to when BioWare would release a Fan Friday and that was all. I think people would probably explode if they ever went back to that. There is something satisfying about getting some info straight from the mouths of the devs, at least for me. Especially getting some questions answered. A: There are certain planets within the galaxy that are only available to one allegiance or the other, but the majority of planets are open to the Republic and the Empire, allowing opportunities to – ahem – ‘encounter’ the other side should you so desire. On first glance, that sounds like restriction. Of course, if you look at it closely, it could mean any number of things. For one, those planets that are not available to all factions could be starter worlds — and I would be fine if they chose to make those faction specific. I have never seen the point in allowing the high level players to gank the lowest of the low level players. That’s not even PvP, unless you can’t beat players your own level. I could actually support making those areas available only to your own faction. Of course, once BioWare clarifies what they mean by that, speculation won’t be needed anymore. A: Generally speaking, these opportunities are all pretty obvious to the player, as they occur along the main path of your Class Quests. We do, however, reserve the right to put some goodies out there for the particularly ambitious player to find. …Whoa. This question was purely about companions. If Blaine Christine’s answer was entirely pertaining to the question, then the “goodies” comment can only mean that there could be hidden companions in the game that not everyone will find unless they seek them out. I hope I’m not the only one who sees how awesome that could be. In a game where there is the possibility of seeing a dozen Vettes in the same area, the possibility of seeing a rare companion that nobody else has sounds absolutely tasty. If such a companion existed, I’m pretty sure I would try and find them. In fact, digging up a secret companion sounds so much more fun than camping out an area for a pet I’ll use a handful of times before I file it away into the back of the pantry, never to be touched again. If nothing else, that might be something your light side/dark side progression could affect: the ability to gain certain companions. After all, I doubt Darth Murderous is going to want to hang with you if you decide you need to be the brooding hero and pout about having to do dark side things as a Sith Warrior. Same goes for Princess Trueheart, who hates dark Jedi, and only wants to travel with the bluest of the blue boy hero-types. Those, of course, are all just theories. But even the theories makes me excited for whatever BioWare might have in store for players during the game. The PAX East thing was kind of Lol-worthy. The bigger surprise would have been if BioWare DIDN’T make an appearance at one of the biggest gaming conventions of the year. That said, I am hoping for a third trailer. I heard rumblings about another one being in the works not long after PAX, and selfishly, I just want another one. Deceived & Hope are just awesome trailers. A third one, maybe with an appearance by the Grand Master of the Jedi Order, Satele Shan, should set the tone for the game quite nicely. Imagine if they unveiled another trailer, then a release date. Damn, Jara, again, this is why I think you should blog! Not only do you have a lot of great stuff to say, you catch things not too many people notice. Myself, for example, I didn’t think even think the Q&A was worth mentioning, since I figured at first glance that he pretty much just rehashes everything we already know. I caught that “encounter” quote too, and didn’t think much of it, since they’ve already hinted at some open world PvP. Recently, there has been some rumors that open world PvP might be something they’ll implement later on though, and not something that would make it into the game at launch. That’s why it occurred to me afterward that maybe the emphasis on the encounters was in part to put aside those worries about the lack of that sort of PvP. Anyway, back to the quote, I wouldn’t be surprised if starter planets were those that were only available to their respective factions. Or maybe they’ll handle things the way WoW does it, they way you can technically “visit” opposing faction home cities even on a PvE server, but you’ll be automatically flagged for any NPC or opposing faction player to take you down. And I thought the exact same thing about the companion question! I just didn’t want to get too excited for it before anything was confirmed. The analogy to pet collection crossed my mind too, though it’s a little wrong of me to think of companions the same way I think about a vanity pet 😛 I think “rare” companions will have many implications, if they will indeed be in the game. Considering the last paragraph in that Q&A, regarding getting quests from your companions and being rewarded. Logically, rare companions = rare quests = rare rewards, so there’s more of a reason to hunt those “hidden” companions down. They said rewards for “you and your party” too, and if they mean player parties, this means everyone can benefit. I don’t dispute that the hope for a release date is pie-in-the-sky, but I always believed that a person is entitled to dream. Dream I will. As for the blog, I would consider it, if only to keep from hijacking yours so much. Somehow, though, the thought makes me cringe. My blog would be the most boring place I can think of. I don’t have the zeal to hunt down pictures to dress it up, nor could I guarantee a fairly consistent stream of content to provide (I doubt I could stay on one topic for all that long). In fact, the attention to detail needed to run a blog is something I always admired/envied in people who have good blogs. They (blogs, websites, vlogs, etc) don’t put themselves together; it takes time, effort, and some imagination. Also, it takes the ability to stay on one topic so you can build a fanbase (such as MMOs in general, like on here). Also, I agree about the “rare companions = rare quests = rare rewards” theory. It does stand to reason that would be the case. Of course, someone is bound to QQ like a 4-year-old in Kmart if the reward for that is anywhere near useful, and not just vanity. That’s why I’m hoping like Hell that is the case. “She may not look like much, but she’s got it where it counts kid” Should echo in the back of your mind for your smuggler ship Mmo Chick :p Don’t forget that! At least i don’t, just because Agents get to sass women/men and drive around in Queen Amidala’s throw away last weekend yacht, doesn’t mean anything about anything :P, all that is completely beside the point….I bet Jewl’a Nightbringer is TOTALLY gonna be a super secret companion…oh man the courting of her to join my crew….oiy a man can Dream right?